Unique to the Testudo™, it is capable of accommodating either 10” x 12”, or large 11” X 14” body armor of any type. With a fully adjustable cummerbund and shoulder straps, the Testudo™ is versatile and viable for large or medium body types. Rugged side retention buckles and straps are included. Each side removable for user adjustable level of retention and comfort, compatible with or without cummerbund installed. We retain a lightweight and durable profile by using genuine 500D Cordura nylon for construction. Strategic lower-offset rear shoulder mounts position the rear plate pocket higher, alleviating the traditional “low hanging” rear plate pocket as seen on carriers that lost sight of proper armor placement. 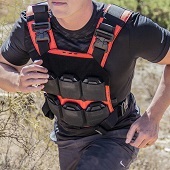 Inner plate retention straps on both pockets further ensure ideal body armor ride height for optimal vital coverage. 3D Mesh Technology dramatically increases ventilation and air-flow for a cooling and comfort improving effect, located on both body facing inner linings, and the removable shoulder pads. Shoulder pads also feature our tri-loop guides and attachment points. Soft loop Velcro lines all webbed sections for added versatility and mounting options. The heavy duty drag handle is fortified by engaging down the rear portion of the plate carrier. Reinforced Bar-tack, double, and double backed stitching throughout contract durability. Derived from years of customer feedback, experience, and understanding, the Generation 2 Testudo™ is all-inclusive and on point, ready to protect the warrior out of the gate. Perfection delivered with no additional accessories required, except armor of course.